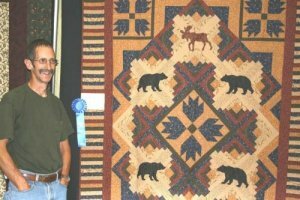 Dan Perkins, co-owner of Threads Galore Quilt Shop & Quilt Inn Rangeley Retreat Center, recently won ribbons for quilts he exhibited in Vermont Quilt Festival, at the Champlain Valley Expo and Maine Quilts 2014, at the Augusta Civic Center. “Spotlight on the Stars”, already an award winner at Maine Quilts 2013 and Machine Quilters Expo 2014, was presented with multiple awards at Vermont Quilt Festival ~ a Purple Ribbon for Exceptional Merit, Best Machine Quilting and The Founder’s Award, a prestigious award presented by VQF founder Richard Cleveland. This 89 inch square quilt was designed and pieced by Dan and free hand machine quilted by Dan’s wife and co-owner of Threads Galore, Carol Perkins. 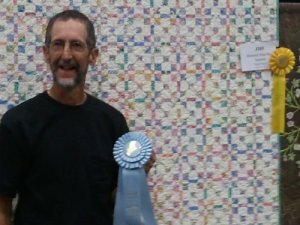 “Lotsa Lemoynes” made it’s quilt show debut at Maine Quilts 2014 and was awarded a 1st place Blue Ribbon by the Maine Quilts judging team. This 85 inch square quilt was also designed by Dan and free hand machine quilted by Carol. 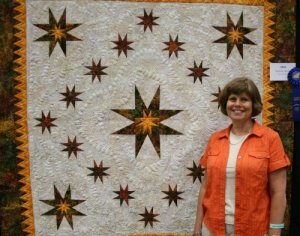 Judge’s comments include “warm grey background allows vibrant stars to sparkle throughout” and “quilting well executed”. Both “Spotlight on the Stars” and “Lotsa Lemoynes” are now on display in the showroom at Threads Galore Quilt Shop. 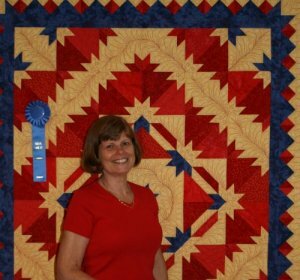 "Spotlight on the Stars" ~ 1st Place Blue Ribbon @ Maine Quilts 2013, 1st Place Blue Ribbon at Machine Quilter's Expo 2014, Purple Ribbon Exceptional Merit, Best Machine Quilting and Founder's Award at VQF 2014. Pictured ~ Dan Perkins & VQF founder, Richard Cleveland. 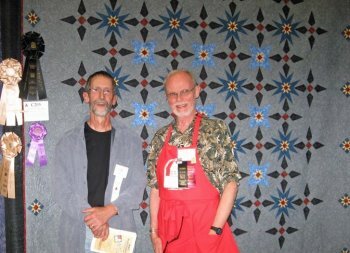 "Lotsa Lemoynes" ~ 1st Place Blue Ribbon @ Maine Quilts 2014. 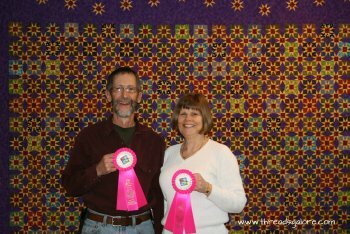 Rangeley quilters, Dan and Carol Perkins, co-owners of Threads Galore Quilt Shop and Quilt Inn Rangeley Retreat Center were recently honored with two awards at the MQX Quilt Festival ~ New England, held in Manchester, New Hampshire. "Sashing Strips Can Make You a Star"
"A Walk on the Ridge"
Dan and Carol Perkins, award-winning quilters of Rangeley and owners of Threads Galore Quilt Shop, were recently honored at Maine Quilts 2011 in Augusta, Maine with ribbons for all three of their 2011 show quilts. 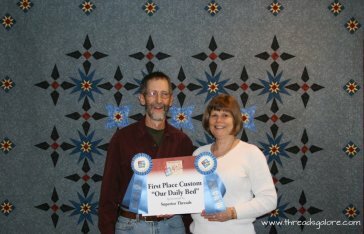 Carol and Dan Perkins, owners of Threads Galore Quilt Shop and Quilt Inn Rangeley Retreat Center, were recently awarded First and Second Place Ribbons at Maine Quilts 2009, presented by Pine Tree Quilters Guild, Inc. Judging points are earned based on each quilt's Overall Impact, Design, and Workmanship. The team of judges for this year's show were Linda Cantrell, Kathy Kansier and Susan Varanka. “Golden Isles”, 58 inches square, is a collaborative quilt, designed by Dan while playing around with EQ6 software on his Mac. The design elements and fabric selection spoke to Dan of the mountains of Rangeley as well as the sea and sand of Dan and Carol's favorite winter oceanside getaway. Oceanic blue, vibrant golds and grass green are accented with a pop of red in this dynamic design. 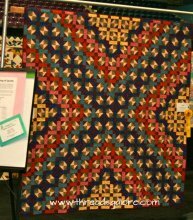 Carol partnered with Dan in the piecing of this quilt with a myriad of technically challenging set-in geometric elements. Carol's original freehand machine quilting adds lots of arcs to Dan's angular design. The repetitive curves may remind the viewer of the breaking of the waves or the edge of a sand dollar. This quilt scored highly in the categories of “Use of Pattern & Design” and “Effectiveness of Color in Overall Design” and was awarded Second Place. 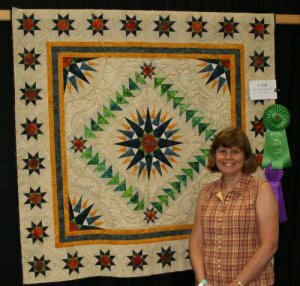 Judges commented, “wonderful flow with angular piecing and curved quilting”; “a striking quilt”; “truly a golden treasure”. The Maine Quilts 2008 team of judges gloriously awarded Rangeley’s local quilt shop owners, Dan and Carol Perkins several ribbons for their original creations, exhibited in Augusta at the July show. Nationally recognized instructors and experienced judges, Lisa Erlandson, Dianne S. Hire and Roberta Horton evaluated each of the 206 judged entries, awarding points in the categories of overall impact, design, and workmanship. 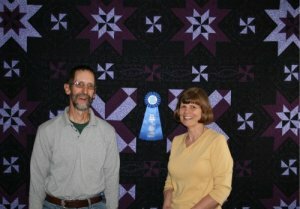 Dan’s quilt, “Crystal Stars”, a large beauty in purple and black was awarded ‘Second Place’. Judges commented, “precision piecing”; “effective and distinctive”; “magnificent quilting”; and “exciting quilt”. Dan loves intricate piecing and interesting geometric combinations. His original design began with the four center crystal-like blocks. 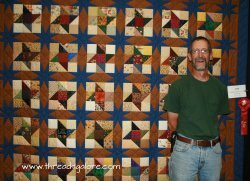 After laying them out on the floor, the quilt evolved with the addition of many pieced stars. 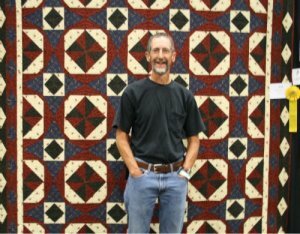 Dan states, “It just grew until I felt it was complete.” Graced with his wife, Carol’s, interpretive machine quilting of curving feathers and angular repeating lines, this quilt is, indeed, a gem. Thus the title, “Crystal Stars”. 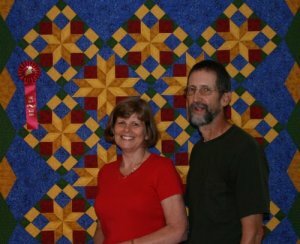 Carol and Dan Perkins, owners of Threads Galore Quilt Shop, were awarded top honors at Maine Quilts 2007 in Augusta this summer. 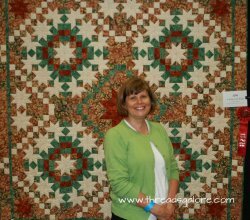 Presented by Pine Tree Quilters Guild Inc., this 30th annual show featured quilts by year-round Maine residents and seasonal visitors. 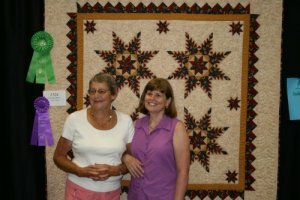 Each quilt was judged on its own merit, overall impact, design and precision workmanship by the panel: Barbara Barber, Rita Hutchens and Lorraine Torrence. 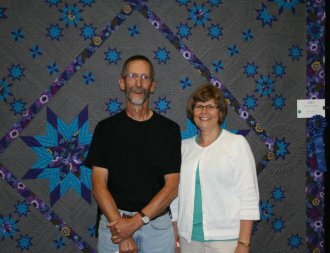 Dan and Carol Perkins of Rangeley were awarded a blue ribbon at Maine Quilts 2006 in Augusta, Maine, earlier this summer for their jointly created quilt, “Starry Bear’s Paw”. 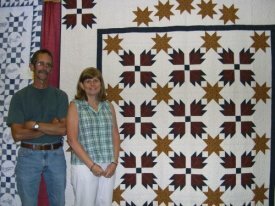 Their entry was judged in the professionally quilted bed quilt category of the show. The patchwork, designed and pieced by Dan, was inspired by Pat Syta’s book, Bear’s Paw Plus, with border inspiration from Knockout Blocks and Sampler Quilts by Judy Martin. The intricate heirloom-quality machine quilting, designed and stitched by Carol, includes feathers inspired by Sherry Rogers-Harrison and Nicole Webb, nationally recognized long-arm machine quilters. Each quilt was judged on its own merit, overall impact, design and precision workmanship by the panel of Marjorie Haight Lydecker, Elsie M. Campbell, and Paula Golden.